As food bloggers with full-time jobs, we hardly ever eat at home. It’s not because we don’t want to, though — it’s because we have no time. And when we do eat at home, it’s usually something fast like pasta (not exactly healthy). Fortunately, we’ve learned a way to create fast, healthful meals at home without breaking the bank — and it’s all thanks to Eleanor Hoh. 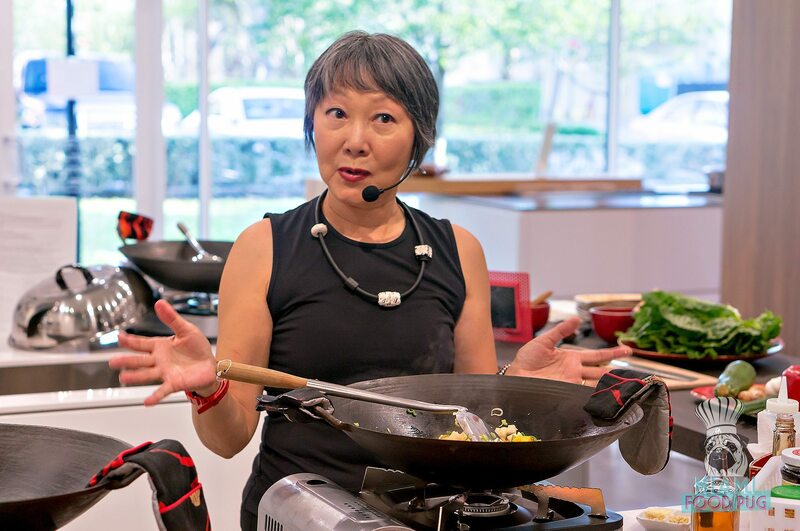 Wok Star Eleanor Hoh hosts monthly classes that educate guests on using a wok. Typically associated with Asian cooking, the wok is a versatile cast-iron device that can help you produce quality, no-fuss meals even if you have no prior cooking experience (::raises hand::). After one of Eleanor’s classes, you’ll be a pro in the kitchen. The intimate and interactive classes let attendees get up close and personal with the wok. Odds are you’ll be selected to cook alongside Eleanor, who will walk you through three dishes during the session. All the while, she’ll share her advice on different cooking tools as well as her tricks and tips for creating the perfect meal. For our particular class, Eleanor showed us how to cook rainbow lettuce wraps, shrimp with broccoli and cashews, and spicy tilapia. We don’t want to get too in-depth about her class and spill her kitchen secrets, but if you attend, you’ll leave with a handy folder full of easy-to-follow techniques to cook just about anything in a wok. Below, you’ll find photos from our recent experience at her class inside Italkraft in Aventura. Her courses fill up fast, so head over to her website and reserve a spot. Once you see what a wok can do, your cooking will never be the same. For more information on how to cook like a Wok Star, visit the official website.